A mutually compact plant,Cuphea hyssopifolia is sometimes called the Mexican Heather and also False Heather.. Bright green foliage and star shaped flowers in abundance make it a useful landscaping plant in a range of applications. Wholesale growers offer a numb of named cultivars for sale. Flower colour will vary depending on cultivar with Cuphea hyssopifolia having mauve, white or pink flowers. The dense foliage and compact growth habit make it a low care plant. The long flowering period, from spring to autumn is an added attraction. Very attractive to bees, butterflies and other insects. With a naturally compact mound forming habit Cuphea hyssopifolia does not need a lot of pruning. Tip pruning after flowering will allow the shape to be little neater if so desired. 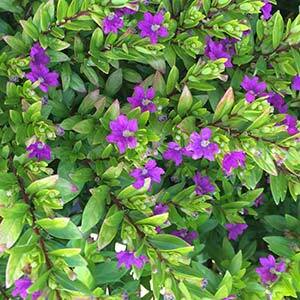 Use Cuphea hyssopifolia as a low hedge or border plant as it takes well to regular light pruning. Alos suited to growing in the garden border, cottage garden, rock garden or in a container on a sunny balcony. A humus rich moist soil is best with regular applications of a slow release type fertiliser in spring. Mulch to help maintain a cool moist root run. Water well though the first summer, and then in dry summers. Soil – Humus rich moist. Flowering period – Spring to autumn. Cuphea hyssopifolia is available for sale from the following wholesale growers.